A £4bn metro system for Greater Cambridge could create 100,000 jobs and 60,000 new homes, a report claims. The feasibility study, commissioned by the Cambridgeshire & Peterborough Combined Authority, has been backed by business and industry in the area. It means work could begin on the so-called Cambridgeshire Autonomous Metro (CAM) as soon as 2021. Mayor James Palmer said the report offers a "a compelling case" for a new regional transport network. 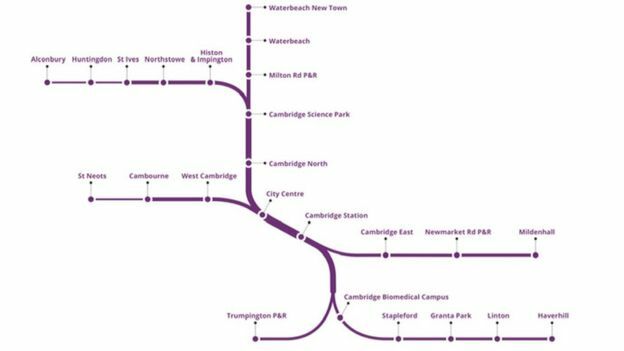 The metro, whose routes would cover 142km (88 miles), will be designed as a "turn up and go" service and include 12km (7.5 miles) of underground corridors beneath the city of Cambridge. It would operate with zero-emission "trackless metro" electric vehicles - at a maximum speed of 55mph (90km/h) - capable of crossing the city in under 12 minutes, the report adds. Crucially, it will encourage a "modal shift" away from the private car which would reduce congestion, emissions and accidents, Mr Palmer said. "The cost would be raised by a combination of local contributions and central government funds. This is one of the most pioneering transport infrastructure projects seen in the UK. The CAM will serve an area of international renown, with a dynamic economy full of world-class businesses, academic excellence and pioneering research and development." Cambridge City Council leader, Lewis Herbert, said the metro would "transform public transport" and "navigate through and under our much-treasured, but medieval, city centre. But to get government support, it is critical that the next stage identifies the funding methods needed to secure close to £4bn in capital".